Chicago-area yoga instructor, Jacquelyn Cotey, is available for individual or group private yoga lessons so you can experience the benefits of yoga at home, the office or other location. If you desire to experience the benefits of yoga and the expertise of Jacquelyn Cotey, but prefer one-on-one instruction in the privacy of your home or office, private yoga lessons may be just what you need. Please complete the short form below to arrange individual yoga sessions with Jacquelyn that fit seamlessly into your schedule. If you are interested in arranging an event or yoga class for your group, big or small, please fill out the form below and Jacquelyn will get back to you with all the information you need. Yoga instructor Jacquelyn Cotey is available for private yoga sessions throughout the northwest suburbs of Chicago including, Highland Park, Northbrook, Deerfield, Lake Forest, Lake Bluff, Libertyville, Mundelein, Gurnee, Lincolnshire, Long Grove and more. If you would like more information about private yoga lessons or a customized event for your business or group, please submit this short form or call Jacquelyn Cotey at (847) 707–9577. Thank you! Jacquelyn will be in contact with you soon! Lifestyles Yoga took center stage as part of the Starbucks Ultimate Coffee Break in Chicago. Working along side wellness-focused businesses, Lifestyles Yoga restored participants through a yoga session in the park. 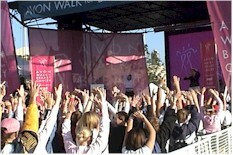 Jacquelyn Cotey "warms up" thousands of Avon Walk for Breast Cancer participants gathered behind Soldier Field along Lake Michigan in Chicago, IL as they prepare to walk 13 to 40 miles over the course of two days, all in an effort to raise funds for breast cancer research! Jacquelyn Cotey conducted twice-weekly yoga classes specifically developed for The Chicago Bears to focus on recovery and relaxation.